The Brazilian Association for Flat Glass Distributors and Processors (Abravidro) is a non-profit professional association that gathers companies from the flat glass sector from all regions from Brazil, as well as syndicates and regional associations. Click here for the list of the affiliated regional entities. Founded in 1990, Abravidro works towards the development of the glass sector in Brazil and follows closely the evolution of the material and its usage in the building, automotive, furniture and major appliance sectors. Its name was Andiv until 2008, when it was renamed as Abravidro, a strong name, easily identifiable within the glass sector. Click here to read Abravidro’s history. O Vidroplano magazine: the biggest, most complete magazine of the Brazilian glass sector. Published monthly, with circulation of 10 thousand copies, it is audited by internationally-recognized organisms and it is the only glass magazine in Brazil with app for mobile access in tablets and smartphones. Social networks: we gathered the biggest glass community from Internet in Brazil, bringing news daily to the experts from the sector in the main social networks: Facebook, Instagram, Twitter, YouTube, Flickr and SlideShare. 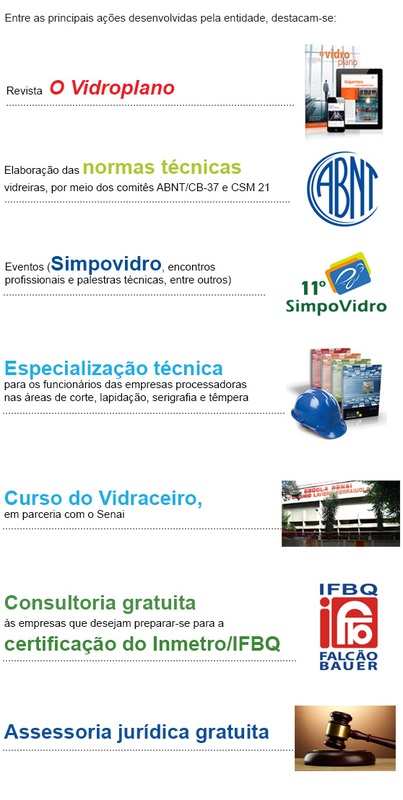 Events: we organize Simpovidro, the biggest glass meeting in Brazil, and we have an exclusive partnership with the Glass South America trade fair, the biggest glass event in Latin America. Certification: the glass tempering companies associated to Abravidro who are interested in preparing themselves for the Inmetro certification for their tempered glass count with a free consultancy from the association. Technical expertise: with new teaching materials developed exclusively by Abravidro, we conduct in-company trainings in the Cutting, Grinding, Screen Printing and Tempering areas to the glass processors that wish to update or capacitate their staffs with a very high technical level. University extension courses: in partnership with renowned higher-education entities, we developed university extension courses on glass to the students and professionals already graduated in the Engineering and Architecture areas. Online courses: there are over fifty online courses in the financial, human resources, operations, management development, marketing and sales areas available for free to the employees from the companies associated to Abravidro or to its affiliated entities. Safety at work: the Program for awareness to prevent work accidents in glass companies is available for free to the companies affiliated to Abravidro or to its regional entities that wish to conduct trainings to their employees. It is composed by a training DVD, the Employer Handbook comic books and a folder for bulletin board. Consultancy for Tax Substitution: Abravidro edits the A substituição tributária aplicada ao vidro plano textbook, available for free to the entire sector. The material is constantly updated in accordance with the alterations in the tax legislations from all parts of Brazil. Legal advice: the companies and entities affiliated to Abravidro count on an expert to clarify doubts related to the legal, civil, tax and labor areas. Portal Abravidro: this web portal gathers the greatest glass content in Brazil in the Internet, with real-time updated news and high technical content. Relationship: as the active voice of the Brazilian glass sector, Abravidro represents the supply chain and its various stakeholders — the government, supplier plants for raw materials and glaziers, among others.